To use Steam Wallet funds, you must register for a Steam account and accept the terms of the Steam Subscriber Agreement. Some games may be age-restricted. Please check age restrictions before spending Steam Wallet funds. Availability and pricing of games applies at the time of download. Steam Wallet funds are not redeemable for cash or credit and are not for resale. Wallet funds are your responsibility to maintain. Internet access is required to use the funds. For minimum system requirements to use Steam and/or use applications available on Steam, see www.steampowered.com. ©Valve Corporation. All rights reserved. 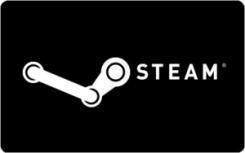 Steam and the Steam logo are trademarks and/or registered trademarks of Valve Corporation. Valve Corporation is not a sponsor of the rewards or otherwise affiliated with Swagbucks. The logos and other identifying marks attached are trademarks of and owned by each represented company and/or its affiliates. Please visit each company's website for additional terms and conditions.